吴琼苗, 李艳, 付笑冰, 杨放, 李杰, 黄惠珍, 颜瑾, 林鹏. Wu Qiongmiao, Li Yan, Fu Xiaobing, Yang Fang, Li Jie, Huang Huizhen, Yan Jin, Lin Peng. Wu Qiongmiao, Li Yan, Fu Xiaobing, Yang Fang, Li Jie, Huang Huizhen, Yan Jin, Lin Peng. Economic burden of hepatitis C patients and related influencing factors in Guangdong province[J]. 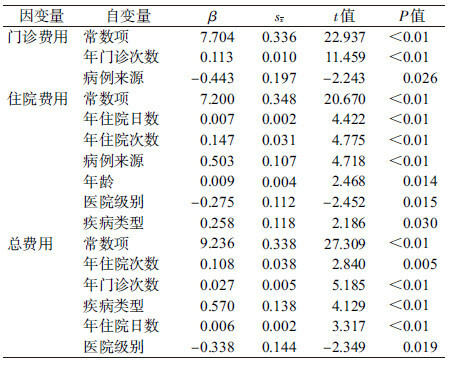 Chinese Journal of Epidemiology, 2018, 39(7): 931-936. Abstract: Objective To investigate the economic burden of hepatitis C patients and related factors in Guangdong province. Methods In this study, cluster sampling method was used to select cases, including acute hepatitis C, chronic hepatitis C and liver cirrhosis cases from eligible outpatients and inpatients in 1 or 2 large general hospitals in all the 21 cities in Guangdong province. Questionnaire survey was conducted for all the hepatitis C patients to analyze their economic burden, while multivariate linear regression model was used to identify the related influencing factors. Results A total of 356 hepatitis C patients were enrolled in the study, with 176 outpatients (49.4%) and 180 inpatients (50.6%) respectively. The average age of the study subjects was (44.79±11.73) year-olds. The annual direct economic costs of patients with acute hepatitis C, chronic hepatitis C and liver cirrhosis were 10 703.22 (IQR:7 396.75-16 891.91), 14 886.63 (IQR:7 274.00-30 228.25) and 28 874.00 (IQR:13 093.69-56 350.00) Yuan (RMB) respectively. The annual indirect costs appeared as 2 426.99 (IQR:1 912.18-7 354.52), 3 235.99 (IQR:1 323.81-6 619.07) and 5 442.35 (IQR:3 235.99-10 296.33) Yuan (RMB) respectively. The annual intangible costs were 5 000.00 (IQR:2 000.00-10 000.00), 10 000.00 (IQR:4 000.00-30 000.00) and 10 000.00 (IQR:3 000.00-100 000.00) Yuan (RMB) respectively. The annual total costs were 22 306.17 (IQR:14 581.24-50 569.17), 38 050.33 (IQR:17 449.57-68 319.62) and 80 152.18 (IQR:40 856.09-228 460.79) Yuan (RMB) respectively. 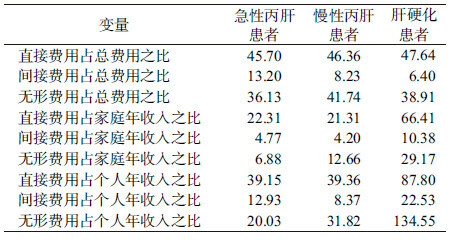 Results from the multiple linear regression analysis showed that factors as:annual hospitalization days, annual number of outpatient visits, annual number of hospitalization, type of disease and the levels of the hospitals were related to the economic burden of patients with hepatitis C. Conclusion Patients with HCV-related diseases presented serious economic problem which calls for close attention in Guangdong province. 秦倩倩, 郭巍, 王丽艳, 等. 1997-2011年中国丙型肝炎流行特征分析[J]. 中华流行病学杂志, 2013, 34(6): 548–551. 刘炜炜. 中国2007-2014年丙型病毒性肝炎新发感染情况估算[D]. 北京: 中国疾病预防控制中心, 2016. 庄润森. 社区居民的疾病经济负担研究[D]. 广州: 暨南大学, 2003. 马起山, 邹宇华, 张顺祥. 疾病无形负担的研究进展[J]. 中国卫生经济, 2011, 30(1): 89–91. 张海瑞. 慢性丙型肝炎患者生存质量评价及相关因素的研究[D]. 大连: 大连医科大学, 2015. 宋晓. 辽宁省某县农村居民丙肝医疗费用及影响分析[D]. 大连: 大连医科大学, 2015. 马起山, 邹宇华, 张顺祥, 等. 广州市乙型肝炎相关疾病住院病例无形费用及其影响因素分析[J]. 中华流行病学杂志, 2011, 32(8): 764–767. 王舒宏, 刘兴柱, 李士雪, 等. 疟疾病例经济负担分析[J]. 中国初级卫生保健, 1996, 10(9): 33–35. Wang SH, Liu XZ, Li SX, et al. Analysis of malaria cases economic burden[J]. Chin Prim Health Care, 1996, 10(9): 33–35. 吕静静, 李仁鹏, 徐爱强, 等. 山东省乙型肝炎病毒感染相关疾病住院患者经济负担及影响因素分析[J]. 中华流行病学杂志, 2013, 34(3): 267–272. 董连晶. 吉林省扶余市丙肝治疗干预措施卫生经济学评价[J]. 中国卫生工程学, 2016, 15(6): 560–562. Dong LJ. Evaluation of health economics on the hepatitis C treatment interventions in Fuyu City, Jilin Province[J]. Chin J Public Health Eng, 2016, 15(6): 560–562. 倪霜, 王利红. 天津市慢性丙型肝炎患者治疗费用降低[J]. 天津社会保险, 2014(3): 30–31. Ni S, Wang LH. The treatment cost of chronic hepatitis C in Tianjin is lower[J]. Tianjin Soc Insur, 2014(3): 30–31. 刘桦, 陈文, 黄韻宇. 广州市丙肝纳入门诊大病项目前后医疗费用的比较研究[J]. 中国卫生经济, 2011, 30(1): 60–61. 刘海平, 邹宇华, 马起山, 等. 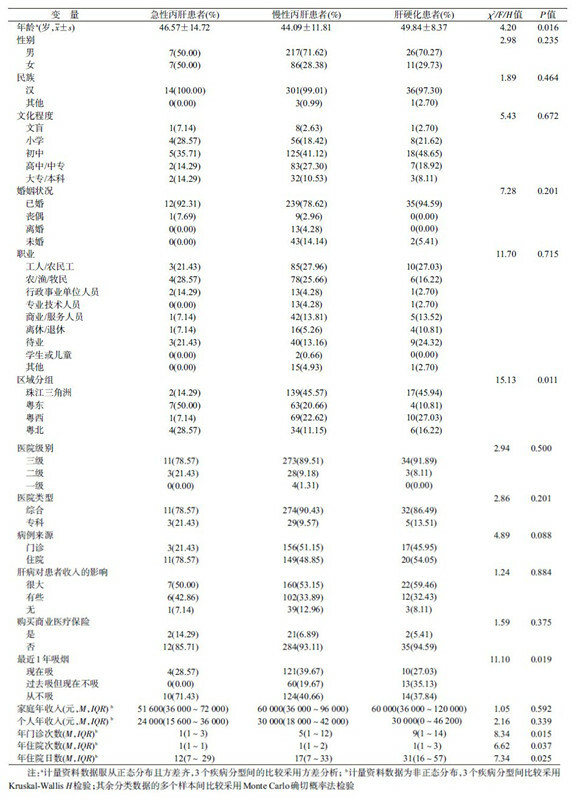 广东省病毒性肝炎患者住院费用及影响因素分析[J]. 中国公共卫生, 2012, 28(2): 135–136.